The open lattice of this apple sliceform makes it relatively easy to assemble. 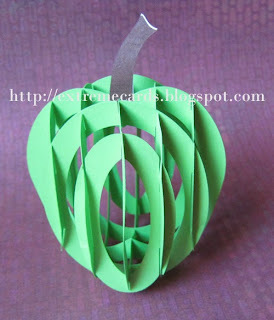 The apple sliceform is constructed in the same sequence as the lattice pumpkin. Download cut file template set, which includes PDF, SVG, DXF, and Silhouette Studio files. Cut pieces. Put stem pieces aside. Refer to pumpkin instructions to assemble. Some of the apple pieces are a little more difficult to place than the pumpkin pieces due to their elongated shape. Keep trying--they will go together! Glue stem pieces in place, sliding the stem slot into the apple slot.